A listed building is a building that has been placed on the Statutory List of Buildings of Special Architectural and Historic Interest. 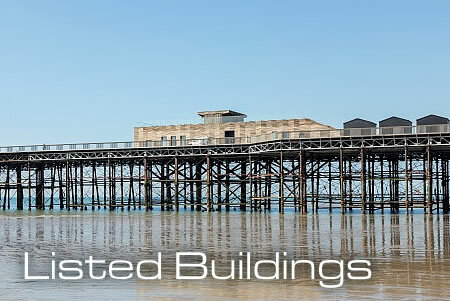 Requirements are put in place to ensure these listed buildings are not altered or demolished without special permission and have to be repaired and maintained. These regulations will ensure the listed building remains intact and maintained, but fire has the potential to completely destroy any property irrespective of its Historic interest. The only way to ensure these buildings are protected from the devastating effects of fire is by installing an automatic fire sprinkler system in the building. This is as good as having a firefighter on duty in the property 24/7. December 2011 Cramond Tower in Edinburgh a 14th Century listed building severely damaged by fire. March 2012 Cholderton House a 17th Century Manor House devastated by fire. April 2012 200 year old listed building in Welch Gate wrecked by fire destroying two homes. July 2014, Eastbourne Pier, A fire on the pier destroyed a third of the structure. April 2015, Clandon Park, Grade 2 listing building was 95% destroyed by fire. The rebuild will be the biggest conservation project in a generation. All of the above could have been prevented if they had had fire sprinklers installed, protect your property and the Country’s heritage to prevent another irreplaceable loss. Manor Houses, Water Towers, Windmills etc, Triangle Fire Systems can install a fire sprinkler system to protect these buildings against damage and loss from fire. See our Case Studies page. We will work closely with officials from Building Control and National Heritage to ensure the system is installed with the minimum of disturbance to the fabric and structure of the building, concealed sprinkler heads will be installed and the pipe work hidden from view.